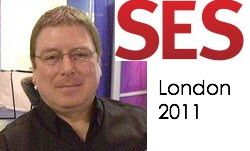 SES London 2011 is approaching rapidly and if you have a ticket or planning to get one you might be wondering: what sessions should I go to, what is interesting? The obvious answer to that is: everything is and pick what fits you most. But you won’t get much further with that kind of information. So I asked the person who can tell us best what is in the program to highlight and pinpoint some sessions for you: the one who set up the program, Mike Grehan. I talked to Mike when he was visiting a conference in San Diego and we originally tried to get this as a video, but unfortunately in the end the footage wasn’t good enough to use as video material, so we’ve turned it into a podcast. You can listen to Mike about SES London in general and the sessions on day 1 here, today you can hear him explain things about day 2 and 3! For Day 2 Mike talks about the party where the famous black hat / white hat session takes place. You will learn more black hat stuff in the bar than on stage. Site architecture also plays a big role on day two. How to handle all the user generated content. He further mentions the “Marketing to the European Union” session and much more. Day 3 of SES London is much more focussed on Social. Mike explains why. Yahoo! introduces “Livestand”, has it found its new objective?